As SBNation's Tom Ziller points out in today's The Hook, Robert Horry will be eligible for the 2014 Naismith Memorial Basketball Hall of Fame class. At the end of next summer, Robert Horry could enter the Basketball Hall of Fame. I haven't bothered to research this. Ziller probably looked this one up and double-checked it to be sure, and he's probably correct, which is good, because the whole rest of his Horry piece is wrong. Wrong wrong wrong. There are certainly a few dramatic and persuasive statistical points to Ziller's argument that Robert Horry does not belong in the Hall of Fame: his career averages of 7 points per game and fewer than 5 rebounds are almost comically underwhelming against the standards of the all-timers, and his playoff averages, despite the reputation as a post-season killer that earned him his nickname, are only marginally better (7.9 ppg and 5.6 rpg). And all but the most ridiculously fervent Horry fans (are there Horry fans? Are there fervent Horry fans?) would agree that he was never his team's best player, never his team's second best player, possibly never his team's third best player, not statistically, not in terms of talent, not in terms of irreplaceability. It almost goes without saying that Horry never made an All Star team. Most of the NBA would have had to boycott the game for him to get an invite in any season of his career. So how in the hell can a case be made that this man belongs in the Hall of Fame? Before we get to making the case for Robert Horry, let's take a wild look around the NBA and settle on another player for point of comparison, this one a sure-fire Hall of Famer: Carmelo Anthony. You're a crazy person if you think Anthony won't one day be in the Hall of Fame. He's a career 25 ppg scorer who has been the best player on ten playoff teams. He's won a scoring title, made six All Star appearances, been on the All NBA team six times, and he's not done. Carmelo Anthony will be in the Basketball Hall of Fame. And even without the numbers, any basketball fan can watch Anthony play and see that he's one of the two or three most talented players in the game. His strength, his gorgeous jumper, his phenomenal, breath-taking footwork, an offensive skill-set so smooth and polished and versatile he can sometimes make even LeBron James look all flailing knees-and-elbows by comparison. He's a spectacular basketball player. If I could choose one NBA player's skill set as my own right this moment, he'd be right at the top of the list. I love to watch him play. The problem with making Carmelo Anthony a Hall of Famer, inasmuch as there is any problem with putting a basketball savant in the Basketball Hall of Fame, is that the inclusion is more for his benefit than that of the history of the game. Astonishing, seemingly effortless mid-range game aside, without the Hall of Fame, the history of basketball needn't include any mention of Carmelo Anthony. Hell, even with the Hall of Fame, it's likely Anthony will be remembered in much the same way everyone remembers Adrian Dantley, who won two scoring titles in the 80s and may or may not have actually existed according to your average casual NBA fan. History tends to forget even the most prolific scorers unless they achieve one or two other largely subjective but overwhelmingly agreed-upon milestones in their careers: being generally considered the NBA's best player for any stretch of time, or being responsible for the kind of instant-classic, feature-of-every-pre-playoff-game-montage-henceforth moment that forces them back into our consciousness every NBA season. In other words, we haven't forgotten Adrian Dantley because he's lousy or overrated or doesn't belong in the Hall of Fame; we've forgotten him because nothing he did forced his way into our consumption of basketball all these years later. One need only to look at the career of Tracy McGrady to understand how this works: McGrady played in seven All Star games, made seven All NBA teams, won two scoring titles, and was the best player on seven different playoff teams. His miraculous 13-points-in-35-seconds career-defining moment came less than nine years ago, and yet, the question is being asked: does Tracy McGrady belong in the Hall of Fame? The outlook is uncertain. Sentiment is mixed, which is absurd: McGrady was at least as formidable in his time as Anthony is in his and Dantley was in his, and he will be in the Hall of Fame. But basketball fans have already largely forgotten McGrady's impact on the NBA and moved on. Sentiment is mixed not because McGrady wasn't good enough at basketball to deserve a spot, nor because he wasn't prolific enough, or celebrated enough in his time. Basketball fans have moved on because the history of basketball need not necessarily include any mention of Tracy McGrady, seen by and large as just another dynamic scorer who didn't change the game in any particularly meaningful way, destined to be forgotten in much the same way Dantley has been forgotten, in much the same way Anthony will be forgotten, punted out of our limited and valuable allotted memory for sports heroes by the greater accomplishments of Kobe Bryant and Tim Duncan and LeBron James. Anthony will need a championship before his career is over or my kids will have to look him up on Wikipedia someday. And yet, Carmelo Anthony and Tracy McGrady and Adrian Dantley belong in the Hall of Fame. Of course they do. But their's is a case of earning one's way in, of beating down the doors with a resumé so strong they simply cannot be denied. 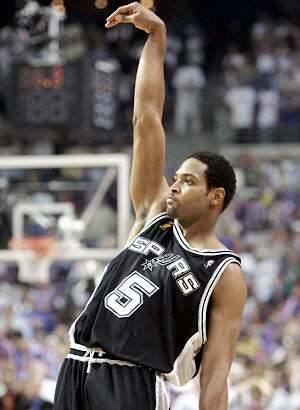 And then there's Robert Horry, Big Shot Bob, a player without whom the history of the NBA simply cannot be told in full. Because Horry was not just a lousy seven points per game spanning an eighteen year career spread across five different NBA franchises. It's precisely because we are arguing his Hall of Fame credentials that he of course belongs in the Basketball Hall of Fame: he is a legitimate basketball anomaly, a fascinating quirk in the record books, a fun and unexpected bit of essential NBA trivia, the role-player who played small and somehow crucial, defining roles on seven NBA title teams, who made the playoffs sixteen times in his career, who factors enormously in the history of the Larry O'Brien Championship Trophy. Of course, in order to agree upon the importance of a player's career to The Story Of The NBA as a legitimate credential for the Hall of Fame, we need to come to some sort of agreement about what the value of the Hall of Fame is as not just an accolade and a list of so-honored retirees, but as a physical plant housing and protecting and displaying the history of the sport through the accomplishments of those most important to it. As fodder for innumerable boring, repetitive arguments about who was great and who was better and what stats are more important and who would have done what in whatever era, the Hall of Fame is reduced depressingly to a turnstile for the such-and-such sans-context statistical-milestone club, where the differences between, say, Dennis Rodman and, say, Kevin Garnett stop at their scoring achievements and do not include the fact that Dennis Rodman would absolutely never have been forgotten by NBA fans whether he won seven rebounding titles or not, that his importance and relevance to basketball fans is based more upon his outrageous personality and that he deserves a note in any credible Hall of Fame for his significance to the history of basketball's many memorable characters. This is the case for Big Shot Bob: that the Hall of Fame protects and tells the history of the game, and the history of its professional champions is central to that story, and there's simply no way a comprehensive history of NBA champions can be told without talking about Robert Horry. This is what makes the Hall of Fame interesting, this relevance as a complete basketball reference guide, not its use as simply a catalog of the game's most prolific players. Big Shot Bob may not have earned his way in with any statistical achievements, but the Hall of Fame shouldn't just be for those guys. The delicious history of NBA basketball cannot be told without mentioning Robert Horry - unlike Dantley and McGrady, the Hall of Fame needs Big Shot Rob more than he needs the Hall of Fame, and that alone ought to be enough. And, if not that, he's got more championship rings than all but eight players in basketball history. Let that satisfy the resumé dorks. Their ridiculous arguments alone will be worth his inclusion.